The official ArchiMate 1.0 spec is colourless. The original ArchiMate project of Telin (Telematica Instituut) used colours, though they were never a part of the spec, they were a more something of a custom. Two different schemes using the original colours blue, yellow and green have been adopted, which one (if any) is the best? The original `ArchiMate Colours’ were blue, green and yellow. Blue was used for the active objects, like Actor and Role at the business level, Application Component on the application level and Device on the infrastructure level. Yellow was used for behavioural objects, like Business Process and Business Service on the business level, Application Function and Application Service on the application level and Infrastructure Service on the infrastructure level. Green, finally, was used for passive objects, like Contract at the business level, Data Objects at the application level and Artifact on the infrastructure level. 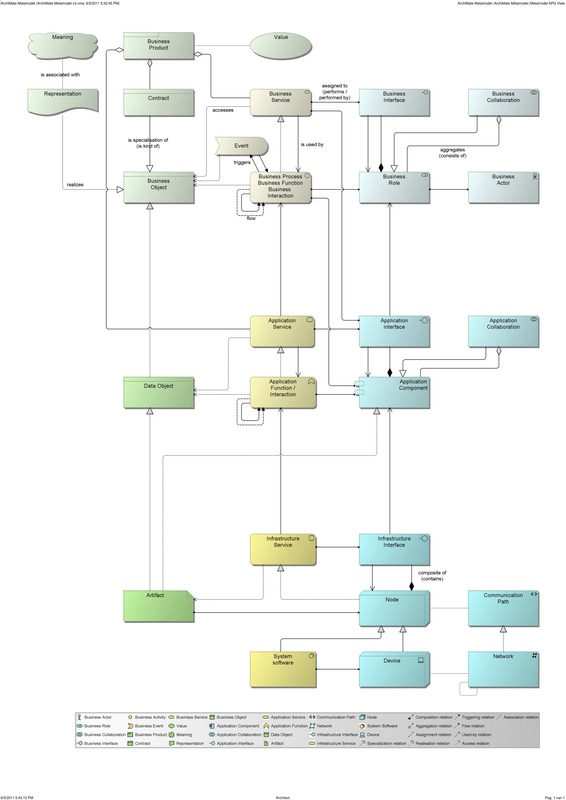 ArchiMate 1.0 is agnostic, but I have a strong preference for the original colouring. The reason is that one of the strong points of ArchiMate is the way it focuses on behaviour as the link between actors and `acted-upons’. In my ArchiMate modeling work, behaviour is actually leading. Take for instance the overview in the previous post. That came about when somebody started a discussion on adding the owner of a system to our model. We realized that owner is a role and hence the ArchiMate-driven question arises: what is the behaviour (process/function) of this role? And what does this behaviour actually change, what is the `acted-upon’ here? Using the original colour scheme strengthens that basic strong point of ArchiMate because it keeps a focus on the different roles the different objects in the ArchiMate grammar play and I find it especially useful because it supports my preference for modeling with behaviour as the central axis around which everything revolves. As you can see, we kept the blue-for-actors, yellow-for-behaviour, green-for-acted-upons separation of the original ArchiMate colouring, but with a twist. We strengthened the colours for the infrastructure level, and softened those of the business level. We could have done this the other way around of course, but it is a fact that the higher you go in your architecture, the vaguer everything gets, so the colours match reality in that sense. Now, if we create overview views with all levels represented (e.g. for a Project Start Architecture), it is immediately clear what is business, what is application and what is infrastructure. It is also immediately clear what are actors, what is their behaviour and what does this behaviour change. It is easy to explain this to business and developers alike. If you check the official ArchiMate 1.0 specification, document C091 from The Open Group, it has color in it. The same with the online specification. Perhaps you are referring to the Van Haren publication. Yes, I was referring to the official printed publication (and what I was told about colour by some of those involved). Interesting. The online spec uses the ‘vertical’ separation (blue for active components, yellow for behaviour and green for passive) I prefer too. Still, though the examples on the site are in colour, I do not recall the text of the specification mentioning the colour. So, am I correct in my statement that colour itself is not officially part of the spec? The pdf from The Open Group is the official standard for testing and certification. That implies the use of color in its graphics and its appendix A Summary of Language Notation. However there is no explicit mention of it as a requirement within the text itself. It probably needs some clarification in a future revision as to its status. Hmm. What does that imply for tools like BiZZdesign Architect that do not conform to this use of colours? It is of course possible to get the colours like this with BiZZdesign, but not easily. Should that affect certification status? And secondly: what is your opinion on our ‘graded’ colour scheme? My personal opinion would be that since there is no textual requirement, then the standard is unclear in this area, and so no conformance distinction can be made between alternate implementations. Its worth noting that there is no official certification program from The Open Group at this point in time, its currently under development by The Open Group ArchiMate Forum. On 2: Personally again, I like the use of color, especially if it has some meaning. I have updated the link to the Architect Profile. As of version 3.2 the format of that profile has changed. The one now available on mediafire works for 3.2.1, probably for all 3.x before 3.2.1 and hopefully for all v3 after 3.2.1. The Appendix could be considered the official language notation, maybe. Actually, it seems that nobody paid attention and it depends a bit on the default settings of the tool used to create the views. Older parts have the column colouring and the newer parts have the layered colouring. I think ArchiMate should not have official colors, but I also think our default 3-column-colours-3-saturation-layers works very well in practice.